standard-title Measure Men Shoe Fit Fix an appointment with us or drop by our shop at One Raffles Place, Singapore, for fitting of your custom made shoes. Fix an appointment with us or drop by our shop at One Raffles Place, Singapore, for fitting of your custom made shoes. Our bespoke shoes consultant comes to measure your foot. At that same time, you decide what shoes you would like to have (i.e. design) and look at the coloring, leather, materials etc. that you like. One size does fits all. With Carl & OAK Bespoke Handmade shoes, measurements are the start and the most important part of our bespoke shoes service. 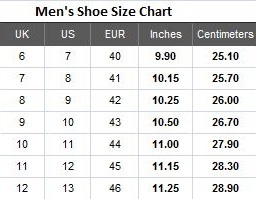 If you choose to purchase our shoes based in standard sizes. You may feel free to do show. Use the ruler to measure the length of your foot from the longest toe (usually the big toe, but depends on the foot) to the back of your heel. Write down the measurement. 3. Measure the length of the foot across the widest part of the foot (usually across the ball of the foot). Fit yourself at a similar time as when you will be wearing the footwear. For daily footwear, fit yourself when you’ve been on your feet all day because your feet have expanded.